NBA star Steph Curry received a sponsor's exemption to compete in the Ellie Mae Classic at TPC Stonebrae. 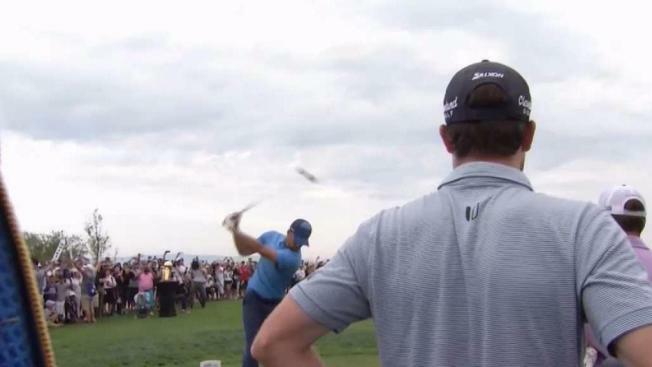 A few hundred Golden State Warriors fans watched as Curry teed off Thursday morning from the 10th hole. Bob Redell reports. Hundreds flocked to the upper reaches of the Hayward Hills Thursday to catch Warriors star and two-time NBA MVP Stephen Curry make his professional golf debut. No, the two-time NBA champion isn't giving up draining three-pointers on the hardwood. Curry received a sponsor exemptions to compete in the Ellie Mae Classic being held through the weekend at Hayward's TPC Stonebrae. The minor league event on the PGA tour normally draws a huge crowd. But Curry's presence Thursday added to quite the gallery. A couple of hundred Warriors fans watched Curry tee off just before 9 a.m. from the 10th hole. Curry's drive looked good form the tee box, but veered left into the rough. He duffed his next shot right into the top of the birm. You could tell the NBA superstar was not pleased with that particular sequence. Curry later chipped onto the backside of the green and followed with a beautiful chip and real close to the hole. He splashed, er putted, for bogey. 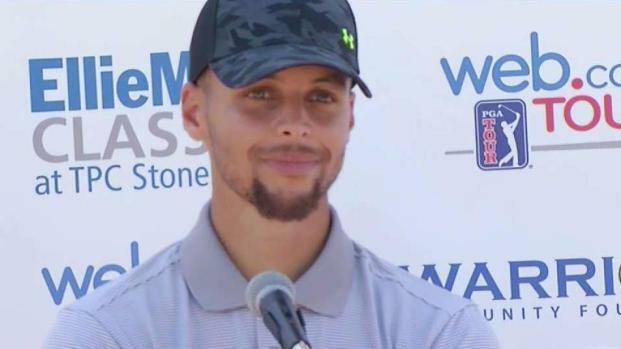 The golf tourney adds to an already eventful summer for Curry. After helping the Dubs earn the team's second NBA title in three years, Curry headlined a China tour with Under Armour, made his acting debut with an appearance in the HBO series "Ballers," and even crashed a house party in Rhode Island. And let's not forget the video of Curry doing rival Lebron James' dance that set social media on fire. The Ellie Mae Classic runs through Sunday. Warriors star Steph Curry is making his professional golfing debut this week in the Web.com Tour's Bay Area stop. The Ellie Mae Classic at TPC Stonebrae starts Thursday, but Curry, who has received a sponsor's exemption, shot a practice round Tuesday. Colin Resch has the story in the above video.